The Maui Native Hawaiian Chamber of Commerce recently featured Renolds Ikaika Fruean and Kahanu Noa at their last general meeting. 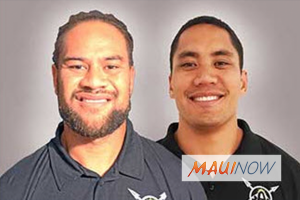 According to the MNHCOC, the duo is on a mission to educate Mauiʻs keiki on the history of Makahiki. During the meeting, Fruean and Noa presented their exciting program, which aims to preserve traditional Makahiki games. The program, the Makahiki Athletic Association, or MAʻA, aims to improve overall health through cultural sports. According to the program leaders, the word maʻa in ʻōlelo Hawaiʻi or Hawaiian, means “to be second nature.” MAʻA is organized through Unda Kava 808, a non-profit sports-focused, intercultural, interscholastic organization. The organizationʻs programs connect diverse communities through cultural, education-based athletic training and competitions in private and public schools. MAʻA has worked with over 11,000 Maui residents over the last two years. Noa said a significant percentage of native Hawaiians have a low socioeconomic status, leading to lower educational achievement, higher rates of incarceration, poverty, and poor health. MNHCOC president Teri Freitas Gorman said MAʻA is working to uplift Mauiʻs youth mentally, physically, and emotionally by creating opportunities for kids to experience cultural sports and friendly competition. “When we grew up, we spent at least two hours a day playing outside. But today, kids spend that much time, and more, playing passive electronic games on mobile devices,” Freitas Gorman said. More information on the Maui Native Hawaiian Chamber of Commerce is available on their website .